Putting It Together was first presented in 1992. 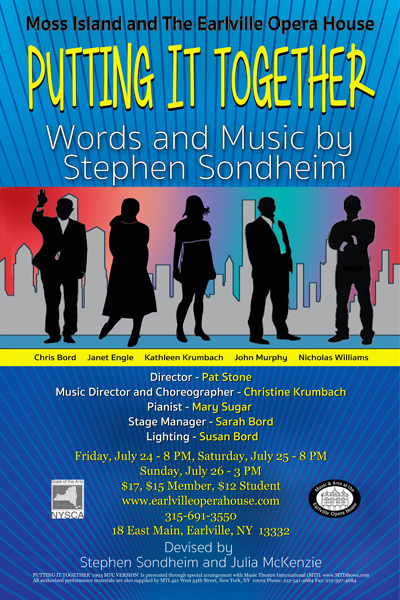 Sondheim had long resisted putting together another revue, following his 1976 hit Side by Side by Sondheim. This is the 1993 Manhattan Theatre Club version, which marked Julie Andrews’ return to the NYC stage after more than 30 years absent. The action takes place at an all-night, black-tie party in a penthouse. The hosts, a middle-aged couple, face their disillusions and marital troubles. A younger, less jaundiced couple struggles with their own ambitions and desires, while a commentator oversees and influences the action. The beautiful songs are among the most well-known in musical theater. Posted in Theater and tagged Theater, Upstate NY Regional Theater. Bookmark the permalink. Mark you calendars…getting ready to tune up our 1893 Chickering Baby Grand here at EOH for a marvelous Stephen Sondheim production!